This post was originally published in 2013, it has been updated with better pictures and answers to reader questions as of April 2019. 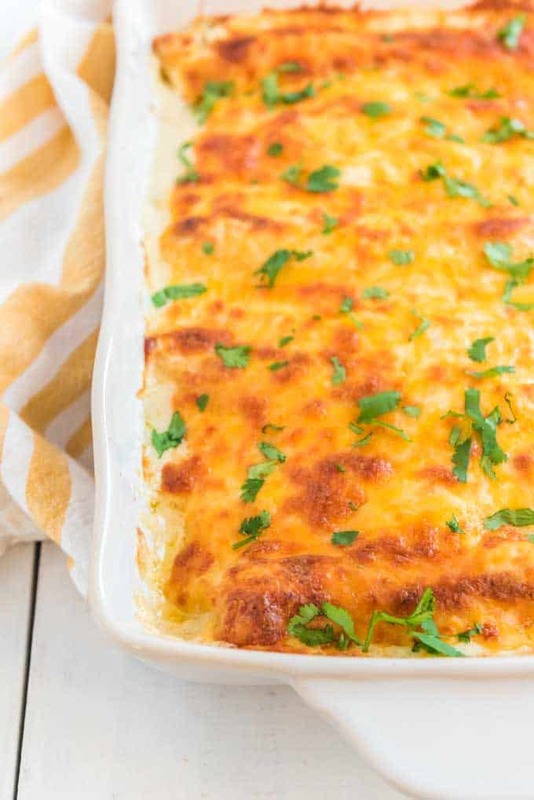 Creamy White Chicken Enchiladas are one of our favorite weeknight Mexican foods to share. I prefer these Chicken Enchiladas to traditional enchilada recipes. These are very kid (and grown-up) friendly and not too spicy, don’t let the chiles scare you! The chicken mixture and cheese and covered in a creamy sour cream and green chile sauce. 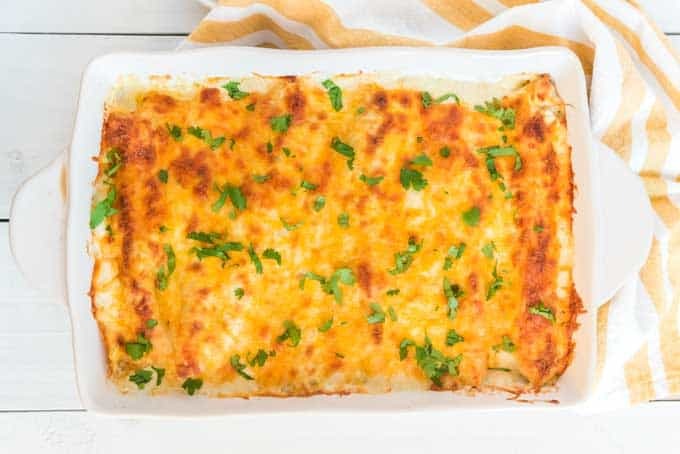 The best thing about this chicken enchilada with white sauce recipe is that it’s very easy to prep and assemble which makes it perfect for those busy weeknights. To prepare the chicken for this recipe I like to throw it in the crock pot in the morning with about a cup of chicken broth and let it cook on high about 4 hours. Once the time is up it can easily be shredded with a fork or by throwing into a stand mixer. See full Shred Chicken in Mixer tutorial here. 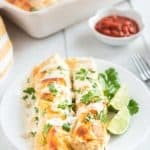 You can also make this chicken enchilada recipe with rotesserie chicken from your grocery store to make it even faster! I personally prefer to make my white chicken enchiladas with flour tortillas. 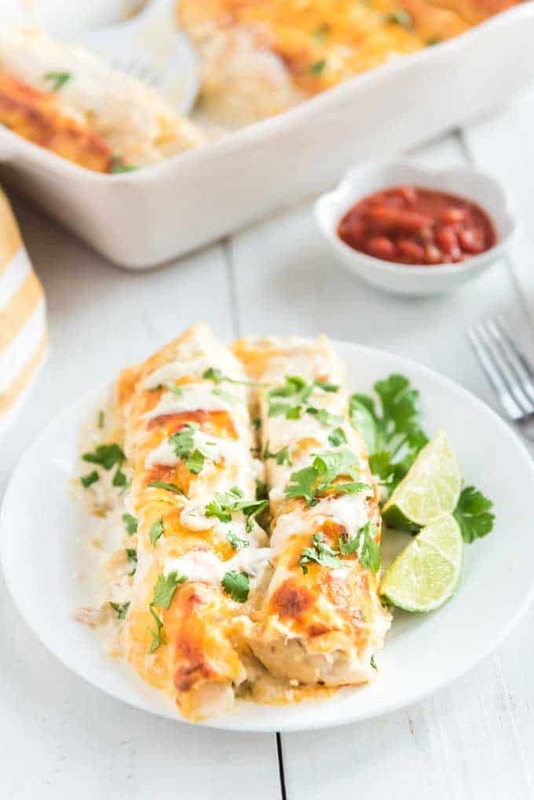 If you are gluten free or wish to reduce calories, you can easily make these chicken enchiladas with white sauce with corn tortillas. The texture will be a little different but they will still be delicious! This enchilada recipe couldn’t be easier. 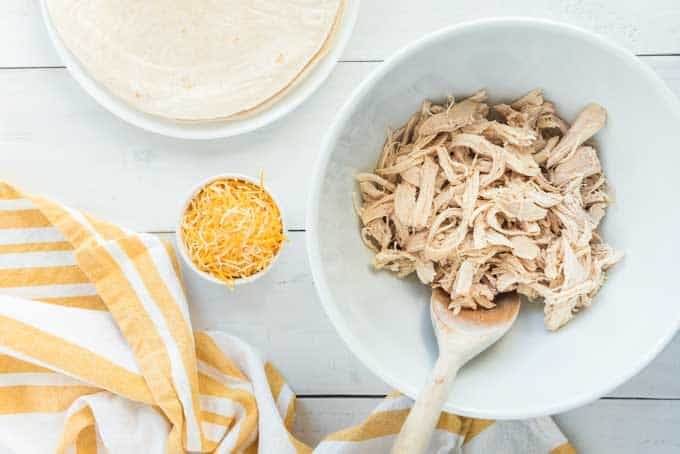 You’ll combine the shredded chicken with half of the cheese and then roll the mixture in flour tortillas. Then you’ll place the rolled tortillas seam side down in a casserole dish. The sauce is made quickly on the stovetop with butter, flour, and chicken broth. You’ll bring to a boil then remove from heat and stir in sour cream and green chiles. Finally, pour the white sauce over the chicken enchiladas and top with the remaining cheese. Then, pop into a preheated oven for 30 minutes! I like to serve these chicken enchiladas with lots of topping options! Sour cream, cilantro, limes, and avocado or guacamole are all great on top of the enchiladas. For sides I usually make up a batch of rice or serve alongside refried beans. These enchiladas will store in an airtight container in the refrigerator for up to 4 days. 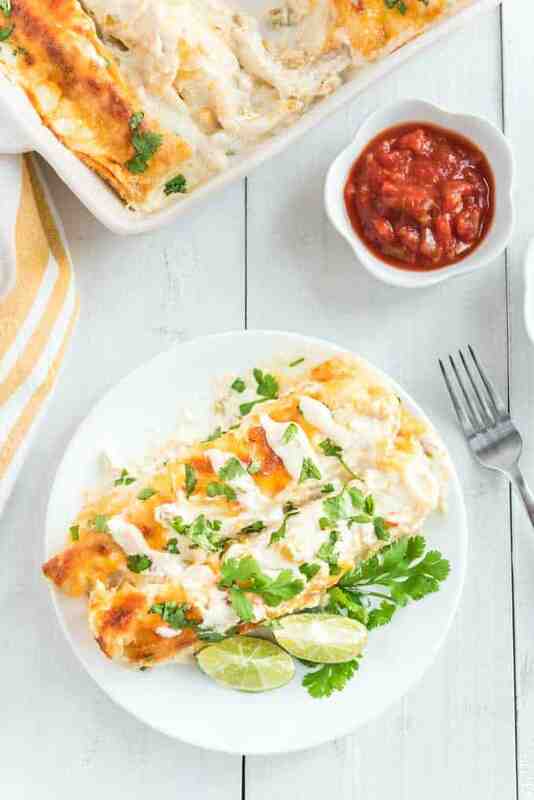 These chicken enchiladas freeze up beautifully for easy meal prep! I suggest freezing the tortillas and sauce separately so it doesn’t get soggy when cooked. Line a casserole dish with parchment paper. 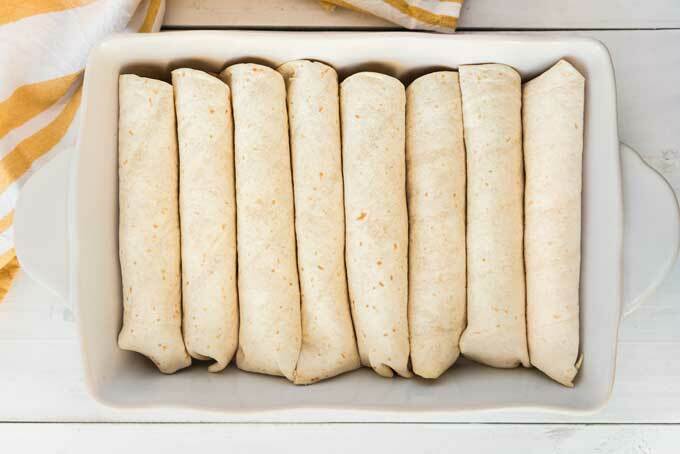 Roll tortillas as usual but do not top with sauce. Place casserole into the freezer until tortillas are completely frozen. Transfer rolled enchiladas to a freezer bag or container and freeze. Cook the sauce as described and freeze in a separate container. When ready to make the enchiladas, thaw the sauce overnight in the refrigerator. Add the frozen chicken enchiladas to a casserole dish and reheat in an oven at 350 F degrees for about twenty minutes. Pour the thawed sauce over the enchiladas, and bake an additional 30 minutes as instructed below in step 12-13. Oh YUM!! Pinned to make soon! We love enchiladas in our house! Your enchiladas look AMAZING!!! One of my favorite comfort foods!!!! I always make them with a red sauce, I should give a white sauce a try!!! Sounds delicious!!!!! This looks absolutely delicious! Pinned! I popped over from It’s Overflowing–thanks for sharing! Have you tried freezing this recipe? If so, did you bake it before freezing it? And how would you reheat/bake after being frozen? I’m sorry Michelle I have never tried freezing it-if you try it I’d love to hear how it works so I can add that to the post. I’ll try it next time! The Enchiladas were a hit at our house tonight! Oh yay! I’m so glad!! I’m so glad you liked it Nancy, I’ll try it with your “kick” added in next time I make it!! I am going to try these this weekend! Just curious, do you use a rotisserie chicken? If not, how do you cook your chicken for this dish? Thanks so much!!! I made the chicken enchiladas for the first time on Super Bowl Sunday – huge hit with my husband! I enjoyed them, but they were very gummy and doughy. Suggestions on how to prevent this from happening? Turned out great! We used leftover chicken from a whole chicken we had cooked the night before. It’s just my husband and I so we halfed the recipe with the exception of the green chilies – used all of them in the sauce because we love that flavor. We also used a 1/4 teaspoon of cumin, chili powder and garlic powder per one of the other reviews about adding a little “kick.” They are turned our great. Thank you for the recipe! This one is a keeper!! !